Extremely unique and waaayy out there. In the best way possible, of course. A quirky take on self examination and what it means to have free will, sacrifice, and what it means to be a family. EVALUATION OF ACTIONS BECOMES A BIG DEAL! Cersei is a bad example. Don’t be like Cersei. Multiple stories all come together in a dark, gloomy, perfectly unsatisfyingly satisfying fiasco of an ending. The characters are so far from perfect you’ll feel as though you’ve passed by them on the street. (I hope not. They’re freaky, but lovable). The characters are the bright stars of the book. They shine like the delicious glaze on the top of a doughnut. Inception, mystery, complete and utter balderdash that will scramble your brain while you sit there captivated. 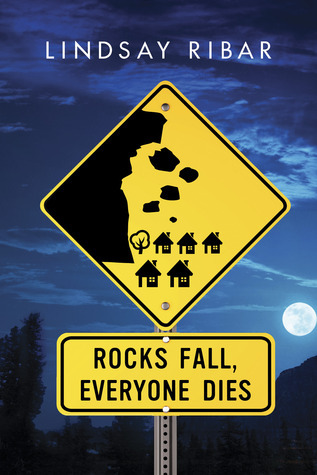 Rocks Fall, Everyone Dies is fantastic. No doubt about it. It is fun, entertaining, exciting, and new. It is thought provoking, eye-opening, and an overall wonderful experience I am proud to be a part of.